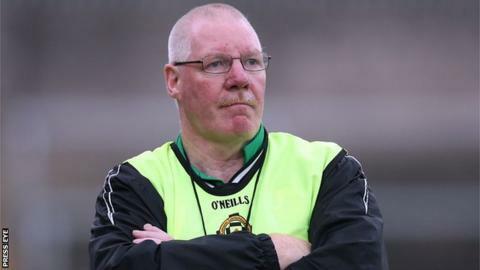 Frank Dawson appointment as the Antrim football manager has been ratified by the county's clubs. The Belfast native was interviewed for the post last week and it was confirmed on Friday that he was the Antrim GAA board's preferred candidate. Dawson's management team will include former Down player Cathal Murray, who has guided St Colman's College to MacRory and Hogan Cup titles. In other managerial news, Aidan O'Rourke has been appointed Louth boss. O'Rourke was assistant to Down manager James McCartan over the last couple of seasons and also was in contention to become Monaghan manager before Malachy's O'Rourke's appointment last month. Lamh Dhearg club-man Kevin Murray will also be part of Dawson's backroom team. Murray, who won an All-Ireland medal with Down in 1991, played on the Clonduff team which Dawson guided to the Down football title in 2000. Dawson managed Burren to a couple of Down football titles over the last number of years and also led the Mourne outfit to an Ulster Club Final. His CV also includes a creditable stint as Down hurling manager. As a player, Dawson won an Ulster Club Football medal with St Gall's in 1982. Antrim Chairman Jim Murray said the process had been made difficult by the standard of nominees for the job. "This is a new era for Antrim football and we believe that Frank Dawson is the man to bring our footballers to the next level," added the Antrim chariman. Dawson said he was "privileged and honoured" to be the new Antrim manager. "I know there is a very good crop of players there at the minute and I am looking forward to getting to work," said Dawson. "Liam Bradley brought Antrim on significantly during the last four years and I intend to build on that success." Former manager Brian White and Gearoid Adams are also understood to have been interviewed for the position. Adams was part of the backroom team of Liam Bradley, who stepped down from the Saffron job after four seasons in charge in August.